What makes a rivalry game great? It’s many things. Friends, co-workers and family members will gather to root for their side. But even in down years, this game is always circled, always in the back of your mind as a Coug/UW fan. And most of all, you just never know what’s going to happen. In more recent years, WSU has been the better team, yet knocked off by UW. But in the past, even in years UW had a Rose Bowl bid on the line, the Cougs have returned the favor (1982 and 1983 ring a bell?). But regardless of the awfulness of the 2008 records, you really can throw it all out on Saturday. That’s what makes college football special, what makes it unique, are these rivalry games. You just never know. Vegas has a handle on it, and right now we’re seeing anywhere from 7.5 to 8.5 in favor of the visiting dawgs. But as recent history suggests, does that matter? Let’s take a look. 2001: WSU was a favorite of seven or so points in this one. We came in at 9-1, and the only loss of the season at that point was a tough 7-point loss to Oregon at home. An Oregon team that would go on to win the Fiesta Bowl that year and had a legit argument for being in the BCS title game. A win over UW would have likely secured a BCS bowl or, at worst, the Holiday Bowl. Meanwhile UW came in at 7-2, but off a horrible loss to Oregon State the week before where QB Jonathan Smith just destroyed the UW defense in Corvallis. But WSU would sputter in the red-zone, with some costly INT’s, one on a halfback pass from Dave Minnich. UGH. UW meanwhile kept going to Reggie Williams, and Marcus Trufant and Jason David just couldn’t stop him. UW wins it 26-14. Underdog covers the spread (1-0). 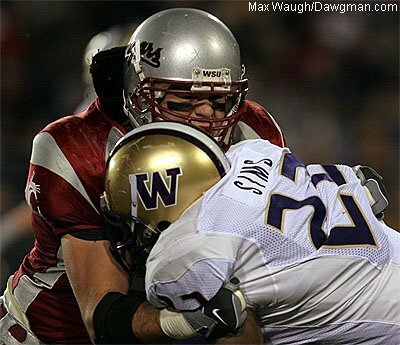 2003: WSU a seven-point favorite at Husky Stadium, yet UW wins, 27-19. A very sloppy game with turnovers all over the place. If you remember that game, WSU moved the ball well at times, but turnovers (six) and major red zone issues (as they did the entire 2003 season) led to settling for Drew Dunning field goals. Plus a young and nervous Josh Swogger had to relieve Matt Kegel, and it just didn’t work out down the stretch. UW still had to rally, and did so, with Cody Pickett hitting Corey Williams in the final minute to take their first lead. UW would return an INT for a TD the next possession, and that was it. Another lesson learned in this one? NEVER over-estimate how a team is going to do in this game based on what they did the week before. WSU was coming in at #8 in the country and had just whipped ASU at home, 34-19, while UW was coming off one of their worst losses ever, 54-7 at Cal. Underdog covers the spread (3-0). 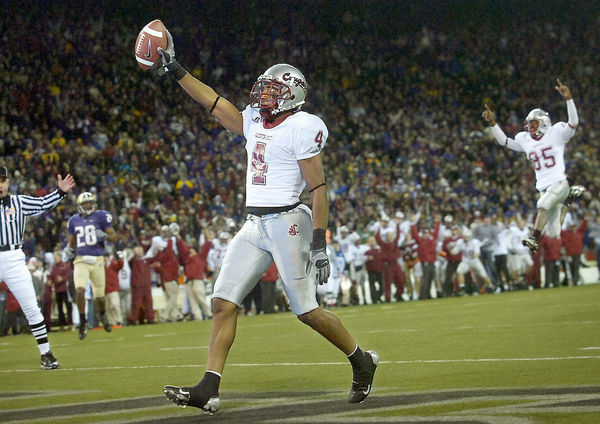 2004: WSU was a 12-point favorite in a tough season, while UW limped in with one win, being talked about as one of the worst Pac-10 teams in a while, their lone win coming over San Jose State. Gilbertson would announce he was stepping down a few weeks before the game, somewhat similar to what UW is going through now. But while WSU sprinted out to a 28-10 lead, UW would insert Isaiah Stanback and rally big-time, cutting it to a 3-point game. But the Cougs would hold on and win in Alex Brink’s first of three Apple Cup wins. Underdog covers the spread (4-0…see a theme here?). 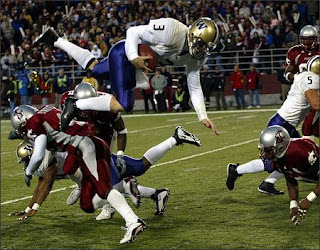 2005: A thrilling game at Husky Stadium, this one saw Brink rally them on the last drive, converting some big third downs and then finding Trandon Harvey on the bubble screen. The rest was history. WSU was a three-point favorite, and with the final score 26-22, it was the first time since 2000 that the favorite actually covered in this series. The favorite covers the spread(underdog now 4-1). 2006: This one still hurts. WSU started hot, 6-3 and ranked in the top 25, before injuries destroyed them down the stretch on both sides of the ball. UW meanwhile had a strong beginning to their season, sitting at 4-2 at one point and looking good for a bowl bid. But Stanback would go down vs. Oregon State in the seventh game of the year, and UW would fall apart, losing the rest of their games, including an awful 20-3 loss to one of the worst-ever Pac-10 teams in Stanford. And then the Apple Cup happened. While WSU was an eight-point favorite, UW would pull it out, 35-32. This game might be looked at as the beginning of the end of the Bill Doba era. Underdog covers the spread (5-1). 2007: Finally, last year. UW came in at 4-7 and feeling good about themselves after a walloping of Cal the week before, 37-23. Meanwhile Alex Brink had his worst-game ever vs. Oregon State the week before, closing out his home career in disappointing fashion, a horrific 52-17 loss that sealed WSU’s non-postseason fate yet again. UW was a six-point favorite, but of course, WSU wins it 42-35 with one of Alex Brink’s best-ever games, 399 yards and five TD’s. YET ANOTHER example of never putting too much stock into what happened the week before a rivalry game! Underdog covers the spread(6-1). So there you have it. Rivalry games are just too hard to call. In the best of seasons, in the worst of seasons, the favorite has only covered the spread one time since 2001. What does that tell you about this Saturday?? You are currently browsing the archives for the Cody Pickett category.